Made in Japan from fine ceramic, this beautiful Japanese sake set features Japanese writing with the words "Issho Isshio" which means, "Laugh to Stay Young". 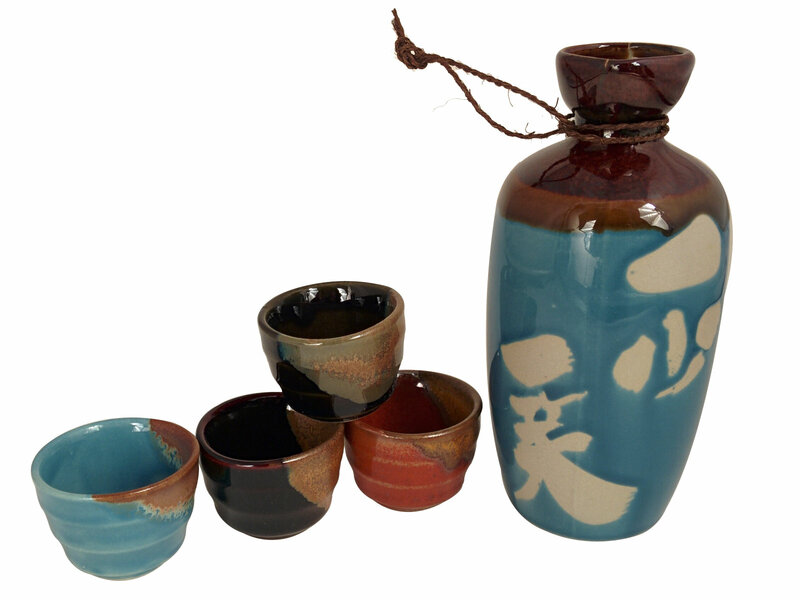 Bring this fine earthen sake set to any gathering with friends so everyone can enjoy laughs together while enjoying some delicious sake. Made from a sandy textured clay, this Japanese sake set makes itself unique by giving a natural earthen look with several different colors of blue, brown, green and red throughout the sake jug and sake cups. The sake jug is a tall traditional flask with a calming blue that fades into light brown to deep brown hues on the top of the flask with a smooth and glossy glaze. The sake jug also has Japanese characters roughly made, exposing the natural sandy clay of the flask with the words "Issho Isshio" which is a phrase that means, "Laugh to Stay Young". The neck of the flask is also adorned with a straw rope to hold the flask when pouring as well. The sake cups are each a different color with an uneven blotch as if dipped in hues of a speckled brown. The sake cups also have small smooth ridges for a better hold as well. Welcome the best of friends to enjoy stories, laughs, and make memories with this "Laugh to Stay Young" Japanese sake set. As it comes prepared in a paper gift box, this calligraphy sake set is also perfect to gift wrap and give as a gift to any new friendship, wedding, or as a housewarming gift. As this item is made from a more sandy and rough textured clay, small crackle glazes are normal to be seen by the spout of the jug which occurred during baking. Hand washing is recommended for this item.